What was believed to be a saint’s shrine in Turkey, has been uncovered as the final resting place of ancient Greek boxer, Diagoras of Rhodes. 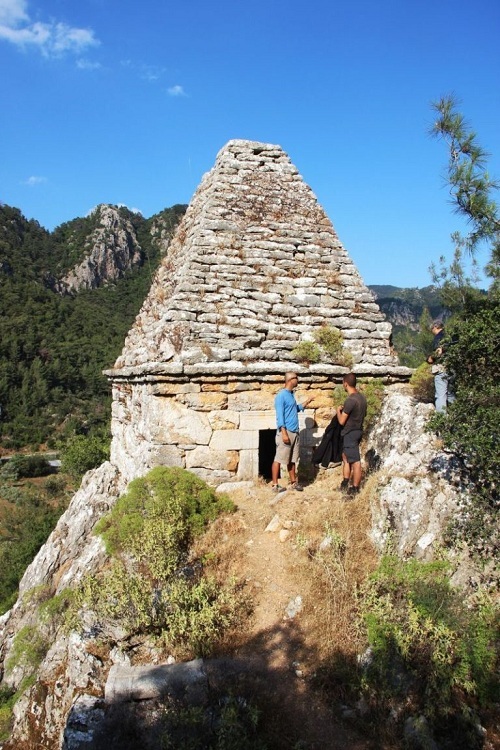 The 2,300-year-old tomb was believed to be a burial place of a holy person by locals in Turgut, located near Turkey’s Aegean coastal town of Marmaris. For years it has been a place of pilgrimage, with many young men known to take a handful of dirt from the site as good luck ahead of joining the army to complete their military service. In the 1970s however, the religious roots of the site were called into question, and according to reports by Turkish newspaper Milliyet, was raided. Now over 40 years on, and it would appear the findings were onto something, with experts now confirming that the tomb has ancient Greek roots. They have discovered that it belonged to Diagoras who lived in the fifth century BCE. A descendent of Damagetus, King of Ialysus and Messenian hero, Aristomenes, he was celebrated for many of his own victories, believed to have won at the Olympics twice, four times in the Isthmian, twice in the Nemean, and once at in the Pythian Games, and the subsequent achievements of his sons and grandsons. A statue of the boxer can be found on the Dodecanese island today. Experts also discovered an inscription in the tomb, stating “I will be vigilant at the very top so as to ensure that no coward can come and destroy this grave,” Milliyet reported. A statue in Rhodes of Diagoras being carried into a stadium by his sons Damagetos and Akousilaos.